Here's a situation that has happened to me more than once: I've been invited to a birthday party. The invitation was sent at the last minute, and the party is that night. I've got to bring a card at the very least, but I'd also like to get a little gift. Fortunately, I live near Multnomah Village — where there are lots of shops in which to find fun and interesting presents. However, I'm short on time and can't wander around from shop to shop. What do I do? I turn to the store that always saves me in situations like this: Peachtree Gifts. 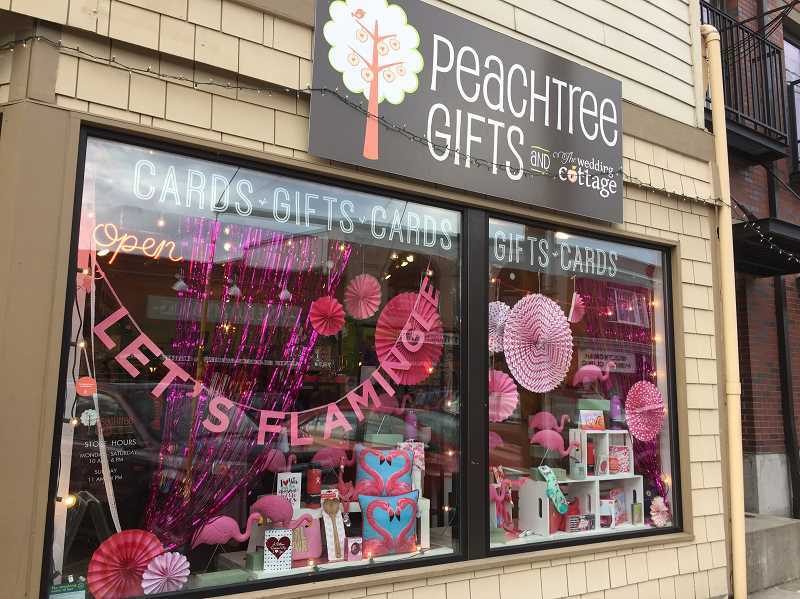 I can't tell you how many times I've popped into Peachtree, not only to grab a cute card and even cuter gift but also to pick up wrapping paper or a nice gift-bag, party plates and napkins, and presents for every occasion. I can rely on them having just the thing I need. I always get my Christmas cards there — I like the ones printed on recycled paper — and always find festive party supplies. This year, unusual socks were on my niece's Christmas list. And that's the thing about Peachtree Gifts — as I pondered where I could get unusual socks without running around to a bunch of stores, Peachtree Gifts sprang to mind. Perfect! When my cousin was having a birthday, what did I find at Peachtree that I knew she would like? Monogramed stationary — her being of the generation (like me) that still sends note cards. What do I do when I realize that Mother's Day is less than a week away and I still haven't gotten a card for my mother and mother-in-law? I dash over to Peachtree Gifts and find just the right ones. Now that Valentine's Day is approaching, there's no better place to find just what you need for your dear ones. The store is Valentine's Central, with jewelry, novelty items and cards. As a matter of fact, owner Petie Farkas said she has been expanding the card section of the store, and now it takes up much of the back half of the space, where you'll find an abundance of humorous and meaningful cards for every occasion. Having just celebrated the store's fifth anniversary last November, Farkas prides herself — especially now in the cold winter months — on making sure the space always has a fresh, fun, bright and cheerful feel to it. And not only is Peachtree Gifts (nestled into a nook between Nectar Frozen Yogurt Lounge and Umpqua Bank at 7843 S.W. Capitol Highway) a mainstay for those who live in Southwest Portland, but Farkas is grateful for the community that has embraced her business as well. "What is wonderful about Multnomah Village," she shared, "is that it has the feeling of a small town within a big, metropolitan city. We see our customers over and over, and we love being a part of that community and gaining that connection with them. "We feel like we can be your neighborhood card and gift shop," she added, "with small surprises that you'll come across here and friendly service." Farkas does all the buying herself, so "if there's something exciting that you want to see, let us know," she said. "We want you to feel like there's something new to discover every time you come in." I know that has been my experience with Peachtree Gifts, and I'm sure it will be yours too. Visit Peachtreegifts.com to learn more. Georgina Young-Ellis moved to Multnomah from Queens, N.Y., in 2015. She explores the world outside of big-box chain stores to find local businesses intent on customer service, customer satisfaction and a pleasurable customer experience. To read more about her experiences at Portland-area shops, visit Searching4Sincerity.com.